"Paclisa" redirects here. For the village of Păclișa in Hunedoara County, see Toteşti. Alba Iulia (Romanian pronunciation: [ˌalba ˈjuli.a] ( listen); German: Karlsburg or Carlsburg, formerly Weißenburg, Hungarian: Gyulafehérvár, Latin: Apulum, Ottoman Turkish: Erdel Belgradı or Belgrad-ı Erdel) is the seat of Alba County in the west-central part of Romania. 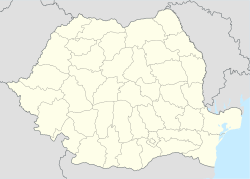 Located on the Mureș River in the historical region of Transylvania, it has a population of 63,536 (as of 2011[update][update]). Since the High Middle Ages, the city has been the seat of Transylvania's Roman Catholic diocese. Between 1541 and 1690 it was the capital of the Eastern Hungarian Kingdom and the latter Principality of Transylvania. At one point it also was a center of Eastern Orthodox Metropolitan of Transylvania with suffragan to Vad diocese. Alba Iulia is historically important for Romanians, Hungarians, and Transylvanian Saxons. In December 2018, Alba Iulia was officially declared Capital of the Great Union of Romania. The city administers four villages: Bărăbanț (Borbánd), Micești (Ompolykisfalud), Oarda (Alsóváradja) and Pâclișa (Poklos). During the Roman period the settlement was called Apulum (from the Dacian Apoulon, mentioned by Ptolemy). When the settlement – upon Roman ruins – became the seat of a dukedom in the 10th century, the population may have been Slavic. The early Slavic name of the settlement was Bălgrad (meaning "white castle" or "white town"). The old Romanian name of the town was Bălgrad, originated from Slavic. The Hungarian name Gyulafehérvár is a translation of the earlier Slavic form, meaning "white castle of the Gyula" or "white city of Julius". Its prefix "Iulia" ("Julius") refers to Gyula, a mid-tenth-century Hungarian warlord who was baptized in Constantinople. Among Ruthenians, the city was known as Bilhorod (White city). The city's Latin name in the 10th century was Civitatem Albam in Ereel. [clarification needed] The first part of the name "Alba" denotes the ruins of the Roman fort Apulum (the pre-feudal white citadel). Later in the Middle Ages, different names occurred as Frank episcopus Belleggradienesis in 1071, Albae Civitatis in 1134, Belegrada in 1153, Albensis Ultrasilvanus in 1177, eccl. Micahelis in 1199, Albe Transilvane in 1200, Albe Transsilvane in 1201, castrum Albens in 1206, canonicis Albensibus in 1213, Albensis eccl. Transsylvane in 1219, B. Michaelis arch. Transsilv. in 1231, Alba... Civitas in 1242, Alba sedes eptus in 1245, Alba Jula in 1291, Feyrvar in 1572, Feyérvár in 1574, Weissenburg in 1576, Belugrad in 1579, Gyula Feyervár in 1619, Gyula Fehérvár in 1690, and Karlsburg in 1715. Under the influence of the Hungarian Gyulafehérvár, the town's Latin name eventually became Alba Julia or Alba Yulia. [better source needed] Its modern name Alba Iulia is an adoption of the town's medieval Latin name. [better source needed] It started to spread in Romanian common speech in the 18th century. The modern name has been officially used since the town became part of Romania. The sixteenth-century German name was Weyssenburg. The Saxons renamed the town to Karlsburg (Carlsburg) in honor of Charles VI. In Yiddish and Hebrew Karlsburg was prevalent; in Ladino sources Carlosburg. Alba Carolina was also a medieval Latin form of its name. The modern city is located near the site of the important Dacian political, economic and social centre of Apulon, which was mentioned by the ancient Greek geographer Ptolemy and believed by some archaeologists to be the Dacian fortifications on top of Piatra Craivii. After Dacia became a province of the Roman Empire, the capital of Dacia Apulensis was established here, and the city was known as Apulum. Apulum was the largest city in Roman Dacia and was the seat of the XIII Gemina Legion. Apulum is the largest castrum located in Romania, occupying 37.5 hectares (93 acres) (750 x 500 m2). Defense wall of Alba Carolina citadel. The Gesta Hungarorum mentions a Hungarian regent named Jula or Geula—the maternal grandfather of Stephen I of Hungary and lord [regent] of Transylvania—who built the capital of his dukedom there during the 10th century. Geula was baptized in the Byzantine Empire and built around 950 in Alba Iulia the first church of Transylvania. The ruins of a church were discovered in 2011. According to Ioan Aurel Pop and other historians, here lived Hierotheos the first bishop of Transylvania, who accompanied Geula back to Hungary after Geula had been baptized in Constantinople around 950. After Stephen I adopted Catholicism, and the establishment of the Catholic Transylvanian bishopric, recent archaeological discoveries suggest that the first cathedral was built in the 11th century or possibly before. The present Catholic cathedral was built in the 12th or 13th century. In 1442, John Hunyadi, Voivode of Transylvania, used the citadel to prepare for a major battle against the Ottoman Turks. The cathedral was enlarged during his reign and he was entombed there after his death. In 1541 - after the partition of the Kingdom of Hungary - Alba Iulia became the capital of the Eastern Hungarian Kingdom and after the Principality of Transylvania and remained so until 1690. The Treaty of Weissenburg was signed in the town in 1551. During the reign of Prince Gábor Bethlen, the city reached a high point in its cultural history with the establishment of an academy. The former Turkish equivalent was "Erdel Belgradı" ("Belgrade of Transylvania" in Turkish) where Erdel (Erdély) was added to prevent confusion with Belgrat and Arnavut Belgradı ("Albanian Belgrade" in Turkish, early name of Berat during Ottoman rule). In November 29, 1599, Michael the Brave, Voivode of Wallachia, entered Alba Iulia following his victory in the Battle of Şelimbăr and became Voivode of Transylvania. In 1600 he gained control of Moldavia, uniting the principalities of Wallachia, Moldavia and Transylvania under his rule, which lasted for a year and a half until he was murdered in 1601, by General Giorgio Basta's agents. Alba Iulia became part of the Habsburg Monarchy in 1690. The fortress Alba Carolina, designed by architect Giovanni Morando Visconti, was built between 1716 and 1735, at the behest of Emperor Charles VI of Habsburg. The leaders of the Transylvanian peasant rebellion were executed in Alba Iulia in January 1785. Important milestones in the city's development include the creation of the Batthyanaeum Library in 1780 and the arrival of the railway in the 19th century. According to the 1910 census, the town had 11,616 inhabitants, of which 5,226 were Hungarians (44,98%), 5,170 Romanians (44,50%), 792 Germans (6,81%) and 287 Roma (2,47%). At the end of World War I, representatives of the Romanian population of Transylvania, the National Assembly of Romanians of Transylvania and Hungary gathered in Alba Iulia on 1 December 1918 to proclaim the Union of Transylvania with the Kingdom of Romania. The representatives of the Transylvanian Saxons decided to join this declaration on 8 January 1919. In 1922, Ferdinand I of Romania was symbolically crowned King of Romania in Alba Iulia. In October 2012—the 90th anniversary of King Ferdinand's coronation—his great-granddaughter Princess Margarita of Romania visited Alba Julia to commemorate the event. The main historical area of Alba Iulia is the Upper Town region, developed by Charles VI, Holy Roman Emperor in honour of whom the Habsburgs renamed the city Karlsburg. The fortress, with seven bastions in a stellar shape, was constructed between 1716 and 1735 by two Swiss fortification architects. The first was Giovanni Morandi Visconti, who built two old Italian-style bastions. The second was Nicolaus Doxat de Demoret—nicknamed "Austrian Vauban". After 1720, the two architects radically transformed the medieval fortress shaped by the former Roman castrum into a seven-bastion baroque fortress, developing Menno van Coehorn's new Dutch system, of which the fortress of Alba Iulia is the best preserved example. Inside the fortress are The Union Hall with the National Honour Gallery, The National History Museum of Unification, the Princely Palace (Voivodal Palace), the Orthodox cathedral, the Roman Catholic cathedral, the Batthyaneum Library, the Roman Catholic bishop's palace, the Apor Palace, and the University of Alba Iulia. Built in the 10th and 11th centuries, the Roman Catholic cathedral is the most representative building in the medieval Romanic style in Transylvania, and is considered to be an important monument of early Transylvanian medieval architecture. The tombs of John Hunyadi and Isabella Jagiełło—Queen of Hungary are located there. The Roman Catholic Cathedral. Its tower dates from the 17th century. The Batthyaneum Library is held in a former church built in Baroque style. In 1780, Ignác Batthyány, bishop of Transylvania, adapted the inside of the building for use as a library. It is famous for its series of manuscripts, incunabula and rare books—such as half of the 9th century Codex Aureus of Lorsch, the 15th century Codex Burgundus and the 13th century Biblia Sacra (13th century). The first astronomical observatory in Transylvania was founded here in 1792. The Apor Palace, situated on the same street as the Bathyaneum Library, belonged to Prince Apor and was built in the second half of the 17th century. At the beginning of the 18th century it was the residence of the Austrian army leader Prince Steinville. The palace was renovated in 2007 under the supervision of the Romanian Ministry of Culture. The Orthodox Unification Cathedral was built between 1921 and 1923, following the plans of architect D.G. Ștefănescu and built under the supervision of eng. T. Eremia. The frescoes were painted by Constantin in a traditional iconographic style. The first monarchs of the Unified Romania, King Ferdinand I and Queen Marie were crowned in the cathedral on 15 October 1922. The National Museum of Unification in Alba Iulia is located in the "Babylon" Building. It was built between 1851 and 1853 for military purposes and became a museum in 1887. The museum exhibits over 130,000 pieces of artworks, organized chronologically. The Unification Hall, also part of the National History Museum, retains historical significance from having hosted, on 1 December 1918, the rally of the 1228 Romanian delegations from Transylvania who determined the province's union with the Kingdom of Romania. The building was used in 1895 as a military casino. The Princely Palace (Palatul Principilor or Palatul Voievodal) was Michael the Brave's residence during the first political unification of the Romanians in 1600. Foreign chronicles pictured it as an extremely luxurious building, richly adorned with frescos and marble stairs, which later deteriorated. During the rule of Princes Gábor Bethlen and George II Rákóczi the second palace was restored, but not to its previous condition. After 1716, the building was used as an Habsburg Imperial Army barracks. David Friesenhausen (1756–1828), Jewish writer, mathematician, and rabbi. According to the 2011 census, there was a total population of 63,536 people living in this town. Of these, 95.3% were ethnic Romanians, 3.2% Romani, 1.9% Hungarians and 0.2% Germans. In 1850 Alba Iulia had 5,408 inhabitants, 2,530 of them being Romanians, 1,009 Hungarians, 748 Germans and 1,121 others. In 1891, the city had 8,167 residents, of which 3,482 were Hungarians (42.63%), 3,426 Romanians (41.94%) and 867 Germans (10.62%). By 1910 the number of inhabitants increased to 11,616. 5226 of them were Hungarians (45%), 5,170 Romanians (44.51%) and 792 Germans (6.82%). At the 1930 census, 38.3% of the population were Romanian Orthodox, 21.4% Romanian Greek Catholic, 14.9% Reformated, 10.5% Roman Catholic, 7.2% Lutheran-Evangelist (Transylvanian Saxons), 6.5% Jews. ^ "Primaria Alba Iulia - Site-ul oficial". Apulum.ro. Archived from the original on 27 September 2011. Retrieved 25 March 2013. ^ a b "Comunicat de presă privind rezultatele provizorii ale Recensământului Populaţiei şi Locuinţelor – 2011" (PDF). Alba County Regional Statistics Directorate. 2012-02-02. Archived from the original (PDF) on 18 April 2013. Retrieved 2012-02-14. ^ The Metropolitan Cathedral of Cluj. Transylvania and Beyond. ^ Iaşi desemnat "Capitală istorică", iar Alba Iulia "Capitală a Marii Uniri"
^ a b c "ALBA IULIA". Jewish Virtual Library. Retrieved 26 December 2012. ^ a b Jarig Bakker (2001-02-10). "Alba Iulia (Romania, Alba)". CRW Flags. Retrieved 2013-10-18. ^ a b c d e f g Patrick Leigh Fermor, Between the woods and the water: on foot to Constantipole from the Hook of Holland : the middle Danube to the Iron Gates, Viking, 1986, p. 138, ISBN 9780670811496, Citations: "The Dacian Apulon became the Latin Apulum, and the place was full of traces of the old Roman colony. But both of these words were silenced when the hushed and muffling spread of the Slavs stifled the old names of Eastern Europe forever. They renamed it "Bălgrad" - the white town (one of many) - perhaps because of its pale walls and this white motif caught on. The Saxons called it Weissenburg and later Karlsburg, in honour of Emperor Charles VI, who built the great eighteenth-century fortress here. The Hungarians had already adopted the notion of whiteness, but another crept in too: the word 'Julius', after a mid-tenth-century (Hungarian?) prince who had visited Constantinople and been baptised there. In Hungarian, Gyulafehérvár, means "white city of Gyula". The Rumanians stuck to Bălgrad, then adopted the medieval Latin name of Alba Iulia." ^ László Bányai, Közös sors--testvéri hagyományok: történelmi vázlat, Politikai Könyvkiadó, 1973, p. 41, Citations: "A középkori latin okiratok Alba Iulia-ja csak a XVIII. századtól terjed el a román köznyelvben" Translation: " the term 'Alba Iulia', used in medieval Latin charters, started to spread in the Romanian vulgar tongue only in the 18th century"
^ Magyar történeti tanulmányok, Volumes 19-21, Acta Universitatis Debreceniensis de Ludovico Kossuth nominatae: Series historica, KLTE, 1986, p. 85 Citations: "Itt említjük meg, hogy Gyulafehérvárat akkoriban románul Belgrad-nak hívták, csak Romániához történt csatolása után lett belôle Alba Iulia." Translation: "We mention it here that Gyulafehérvár was called Belgrad in Romanian and it turned to Alba Iulia after it became part of Romania." ^ "Alba Iulia Online". Apulum.ro. Archived from the original on 11 February 2012. Retrieved 25 March 2013. ^ Curta, Florin (2006). Southeastern Europe in the Middle Ages, 500-1250. Cambridge University Press. pp. 189–189. ISBN 978-0-521-89452-4. ^ Silber, Michael K. "Friesenhausen, David". YIVO. Retrieved 9 August 2014. ^ "Oraşe înfrăţite (Twin cities of Minsk) [via WaybackMachine.com]" (in Romanian). Primăria Municipiului Chişinău. Archived from the original on 3 September 2012. Retrieved 2013-07-21. ^ "ERDÉLY ETNIKAI ÉS FELEKEZETI STATISZTIKÁJA" (PDF). ^ Gyulafehérvár. A Pallas nagy lexikona. Hungarian Electronic Library (MEK). ^ Gyulafehérvár. Révai Nagylexikona, vol. 9. p. 237. Hungarian Electronic Library. ^ Recensământul general al populaţiei României din 29 Decemvrie 1930, vol. II, p. 522. Wikivoyage has a travel guide for Alba Iulia.